Provide the file selection with a title. Click here for more information about defining titles. Opens a dialog where text can be entered that is shown instead of the icon on end devices incapable of showing images. 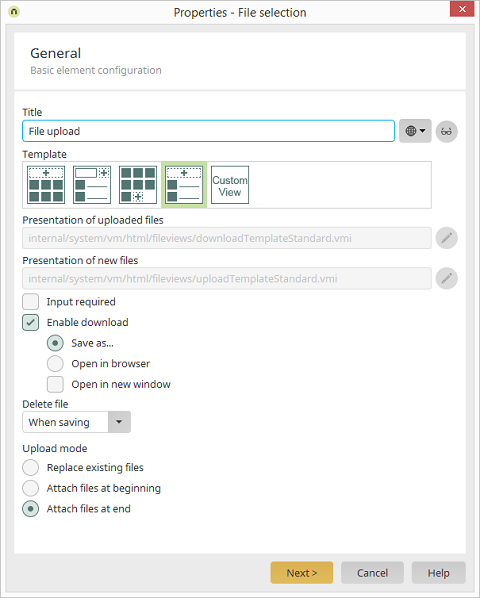 This area shows you templates that you can use as a layout for the information about the uploaded files. The "Custom view" template enables you to integrate your own Velocity files for the web presentation. When you click one of the preview images, the paths to the corresponding Velocity files in use will be refreshed in the fields below the preview images. Click on the "Custom display" preview image to empty these fields and activate the edit buttons. Opens a dialog where you can select a Velocity file which should be used for your own template("Custom view"). This setting makes the file selection a mandatory field. This option allows users to download the file. Users can save the file after downloading it. Users can open the file in the browser after downloading it. With this setting, the file will open in a new window when it is opened in the browser. A button will not be shown in the end device that allows the file to be deleted. A button is shown to delete the file. The file will only be deleted, however, when the entire data record is saved. A button is shown to delete the file. The file is immediately physically deleted when the user clicks this button. Please note that if you choose the "Immediate" setting for deletion, the file will be irrevocably deleted, regardless of whether the entire data record is saved. With this setting, files of the same name will be replaced in the upload procedure. New files will be inserted at the top of the file list. Intrexx uses an internal sorting field for this. Causes the files to be attached at the end of the list.